We’re shining a light on a number of universities’ marketing claims that can’t be verified, following a recent Which? investigation. We analysed comparative claims made by UK universities, and found that at least six make unverifiable claims on their website, in likely breach of advertising standards. A ‘comparative claim’ in this context is where a university compares its performance with competitors by saying, for example, that it’s world-leading in a certain field or more prestigious than rival institutions. Our findings are concerning, especially since the Advertising Standards Authority (ASA) issued advice to universities about this very matter in November 2017. Your rights on your university course: what to do if your course or university isn’t as you expected. Edinburgh’s Heriot-Watt University describes itself as ‘one of the world’s leading universities for pioneering research informed by the needs of business and industry’. This claim was not supported by accessible facts and figures on the website, and Heriot-Watt is ranked 351st-400th out of 1,103 institutions in the Times Higher Education World University Rankings 2018. Aston University claimed that it was ‘ranked within the top 35 universities in all university ranking tables’ – but there’s no information included to back this up. The University of Aberdeen asserted that it’s ‘ranked consistently among the world’s top universities’, without any information to verify this. Newcastle University included a Key Facts document on its website that stated it was in the top 1% in the QS World University Rankings. It came 141st in the current table, putting it in the top 15% of ranked institutions. Ulster University stated that it’s ‘in the top 3% of universities in the world’ on its profile page and included a ‘top 2%’ claim elsewhere. It came 501st-600th out of 1,103 institutions in the Times Higher Education World University Rankings and 601st-650th in the QS Rankings. University of the West of Scotland claimed that it ranked in the top 3% of universities worldwide, but came 501st-600th out of 1,103 in the Times Higher Education World University Rankings. Newcastle, Ulster and West of Scotland asserting to be in the top 1% or 3% of world universities is a perfect example of how claims can be misinterpreted. In neither the QS nor the Times Higher Education World University Rankings are all universities ranked. The QS World University Rankings rank 1,000 institutions and Times Higher Education World University Rankings rank 1,103. It is not clear exactly how many institutions there are; the Times Higher Education World Rankings refer to 20,000 universities worldwide but others use different estimates. However, the claims made by these universities are based on the assumption that the universities selected for each of these rankings are all better than the rest. We think that this is potentially misleading and we’re calling for more transparency. For example, a university could publish its position within relevant rankings rather than assert a top 1% or 3% position without additional contextual information. Read more: what do university league tables really tell you? When universities make comparative claims about their relative performance, these should be verifiable. Otherwise, they could potentially mislead prospective students. Alex Hayman, managing director of Which? University, says: ‘It is critical that prospective students should be able to trust the facts that higher education institutions are putting forward. However, we’ve found numerous examples of universities falling short. We notified the six universities that we believe are potentially misleading students, ahead of publishing this story. Newcastle and Aston universities removed the claims from their websites, and the University of Aberdeen told us that, moving forward, it will provide clearer supporting information for its claims. Heriot-Watt stood by its claims, citing its links with business and industry; University of West of Scotland asserted that its claims are backed up. Ulster University said that its top 2% figure was based on the total number of higher education institutions worldwide (using an estimate of 26,000), rather than its position within rankings. Look for references to back up any claims made by universities. Delve into the university’s reputation for your subject. 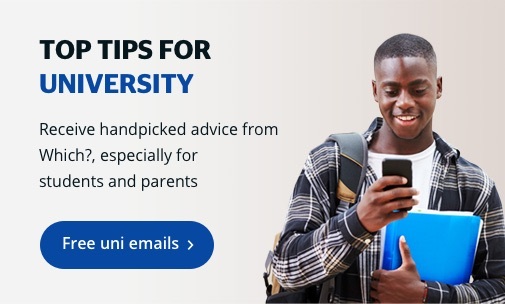 Ask a university about its links within a sector or specific company, especially if you’re pretty sure of your post-university plan. Read student reviews. You can search the Which? University site for these. Ask a university for information if you have a question, whether that’s via email, phone or social media. Remember: there are no silly questions! Which? University helps you make informed education choices. For instance, it has profiles for all public universities across the UK, letting you directly and fairly compare universities to make an assured decision. Plus, we help you choose the right A-levels and put in the best application. We even have our own personal statement builder. We also have advice on whether an apprenticeship is right for you, preparing for university, student finance, and much more. And best of all… it’s completely free to use, impartial and hosts no advertising. Which? University – let us help you make the best education choice for you.